Coneflower is a staple in perennial flower borders all over North America. It's not just because they are widely adapted - they are also tough, long-lived and available in enough shades to match any color scheme. If you're interested in herbal medicine, you may know this plant by its botanical name, Echinacea. Herbalists use the roots of coneflower/echinacea in herbal remedies, but gardeners are typically more interested in its floral display. Coneflower are closely related to black-eyed Susans which they resemble along with many other species in the daisy family. The biggest difference in appearance between coneflower and its relatives is that the flower petals droop down in a graceful fashion that creates a cone shape. The center of the flower is similar to the eye of a black-eyed Susan but is lighter in color and has a pronounced cone shape, as well. The foliage of coneflowers stays very low to the ground, so low that it's usually all but invisible in a mixed border including taller plants. The flower stalks, however, rise two to three feet above the leaves, blooming in mid-summer and sometimes again in late summer. Rose pink and light purple are the most common colors, though breeders have introduced many other shades, ranging from pure white, yellow, and orange tones to those that display a mix of sunset colors on one plant. 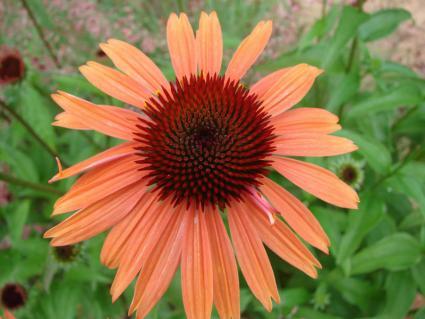 Coneflower can be planted in spring or fall in a sunny location with good drainage. To establish a large patch, it's best to loosen the soil over the entire planting area (by hand or with a tiller) to a depth of at least six inches prior to planting, as this will allow the plants to spread out and fill the space in between them. Otherwise, simply dig a hole about 50 percent wider and deeper than the root ball and put it in the ground, ideally with a shovel full of compost. 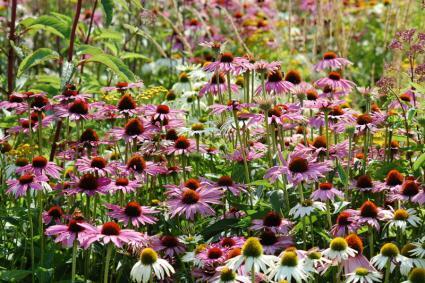 Echinacea plants should be spaced about 18 inches apart. Coneflowers are typically incorporated in perennial borders, though some of the colorful designer varieties are look great on a patio in a matching pot. They are also one of the best species for attracting butterflies, making them a great choice for a habitat garden. Coneflowers are native to a large portion of North America and are so well-adapted that fertilizer, irrigation and pest management are generally not needed as long as full sun and modestly rich garden soil are provided. They grow and flower most prolifically if weekly irrigation is supplied, but they are actually quite drought tolerant and generally subsist just fine on available rainfall, except in the arid western U.S. 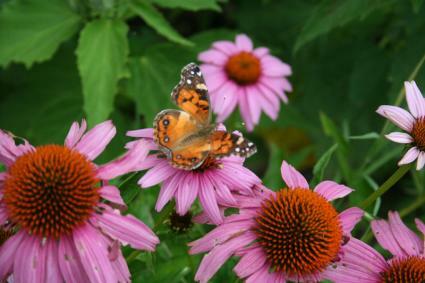 There are a couple maintenance chores associated with echinacea, however. The first is to keep the weeds at bay; the low-growing foliage is a poor competitor with other vegetation and can easily become starved for sunlight. Maintaining two to three inches of mulch around the base of the plants is a big help to keeping weed pressure down. The other chore involves removing the spent flowers. Clipping them off the stalk as they fade during the growing season encourages repeat blooming. With the first frost in fall, all of the aboveground portions of the plant will turn brown and can be cut to the ground. Or, you can leave the dried flower stalks as part of the winter garden and cut them to the ground in early spring instead. The seeds are a great off-season food source for birds. 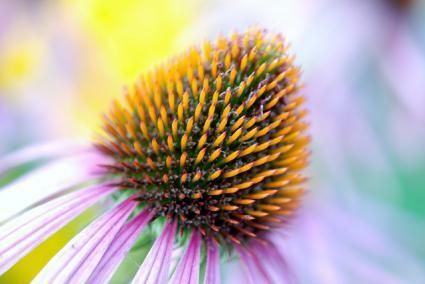 Purple coneflower (Echincaea purpurea) is the most commonly grown and most robust of all the coneflowers. A close second is the narrow-leafed coneflower (Echinacea angustifolia) which looks similar but has narrower leaves and petals. Beyond these two basic types there are numerous cultivators and hybrids, some of which are quite dramatic in their appearance. Alba, White Swan and White Lustre are common varieties with pure white flowers. Merlot, Fatal Attraction and Tomato Soup are some of the top varieties in shades of red. Sunrise, Sundown and Mac and Cheese are examples of multi-hued coneflowers that come in shades of orange, yellow, salmon, and peach. Coconut Lime and Green Envy are some of the most unusual cultivators with green petals. Whether you want to grow it for its famous immune-enhancing properties or its bright cheery blooms, echinacea is a plant that is easy to adore. Through its simple good looks and ease of growing, it has earned the adoration and trust of gardeners everywhere.